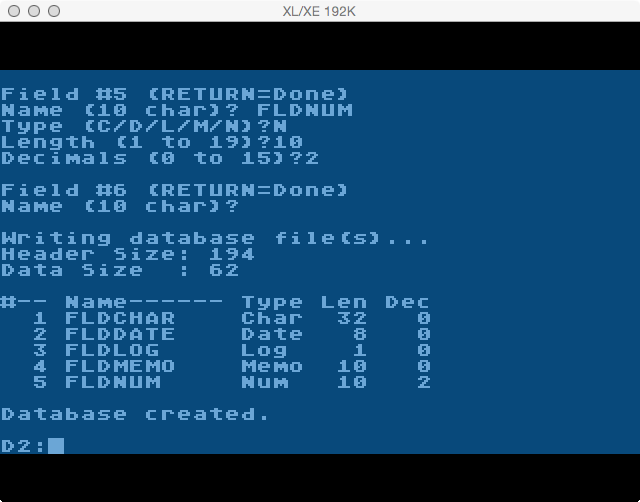 Following up the DBFINFO program the next logical step is to write a program to create a dBase file. I was able to use the skeleton of DBFINFO so some of it will look familiar. The program I wrote (DBFMAKE) will create a dBase III DBF file and optionally a DBT file if there is a memo field defined. 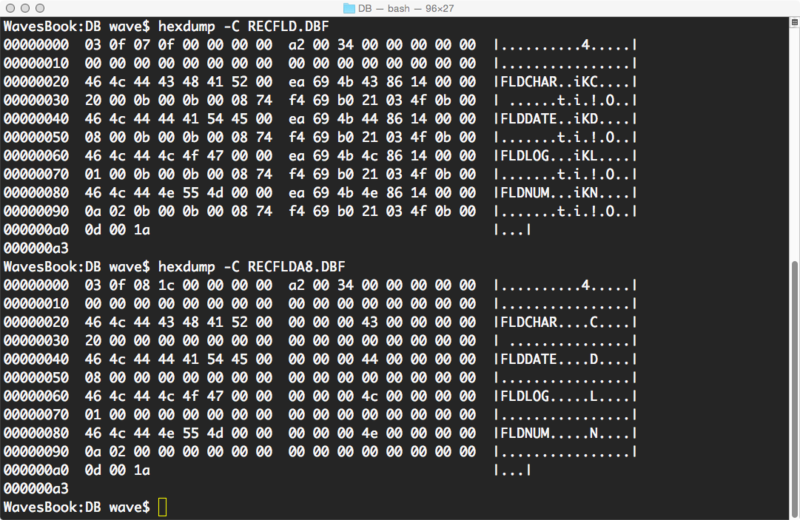 One of the things you will notice is the file contains a lot of $00 bytes whereas the same structure created on a PC will have pseudo-random bytes in it. The PC programs generate garbage into the files so the difference is expected. When you disect a file created on the PC this garbage appears to be parts of memory dumped into the file. Maybe it’s a quick way to write large numbers of bytes at once, I don’t know. At any rate the difference doesn’t matter. 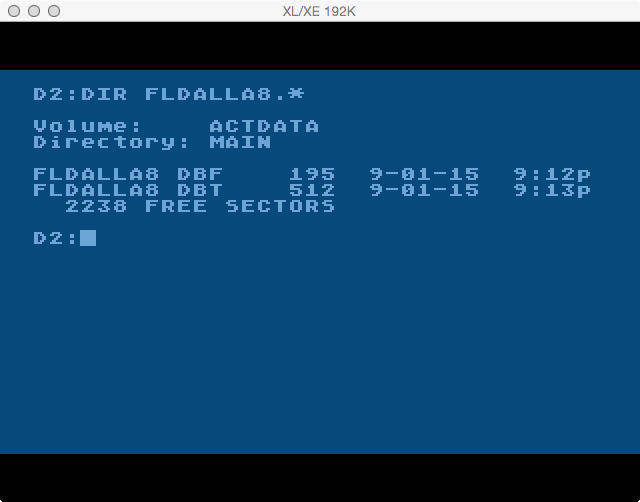 The files I have created on the Atari 8 bit and transferred to the PC were usable and caused no issues. One thing I noticed is that after adding records the DBT file no longer had $00 bytes, but instead had the pseudo-random garbage again. PC by-product. At any rate the garbage appears in non-positional (non-data) bytes. Additionally I don’t foresee the Atari ever utilizing the multi-user bytes, code page language bytes, or a handful of others that make no sense for the A8 platform – so those are all defined as $00 as well. This program, DBFMAKE, will ask for the current date. 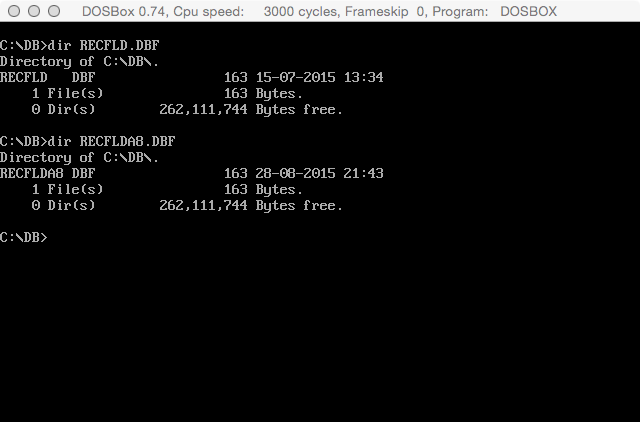 The date is needed because three of the first four bytes in a DBF file represent the date of last modification. For now it’s manually input. In the future I may try to have it seek out a Z: handle and read the date from it since it should be an RTC (real time clock), then resort to input if the date can’t be determined automatically. It will then ask for a filename. This is input WITHOUT an extension. The program will append DBF and DBT as needed. After that it will loop asking for fields, up to the maximum of 128. It requires a name (up to 10 characters) and a field type (Character, Date, Logical, Memo, Number). If the field type is Character it will ask for the length (up to 254 characters max). If the field type is Number it will ask for the size in characters (up to 19), and the decimal precision (up to 15). Pressing RETURN on a field name will terminate input at which point the file(s) are created and the structure is displayed back as confirmation. The signature byte will be either $03 or $83. 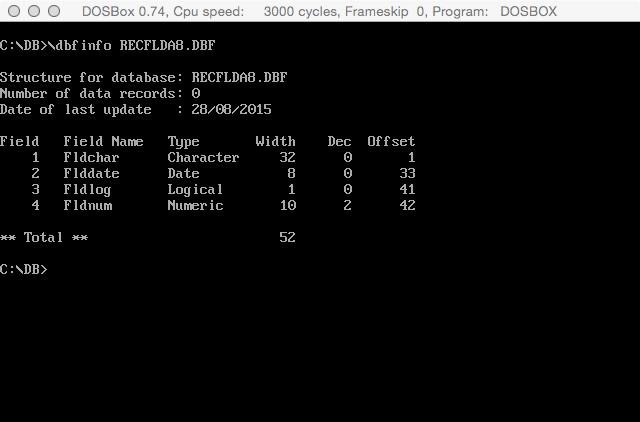 These are dBase III identifiers for database without and with memo fields respectively. 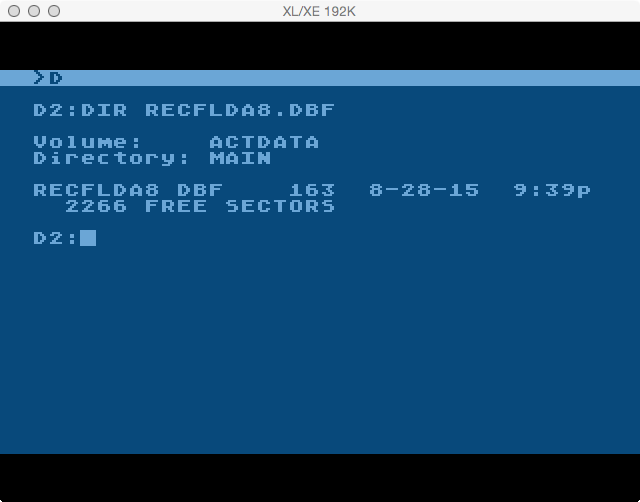 I could have used a new identifier to signify dBase III on Atari 8 bit as the dBase flavor (like FoxPro, etc), but a) it’s premature for that; b) programs on the PC wouldn’t recognize it. So, I imitate. 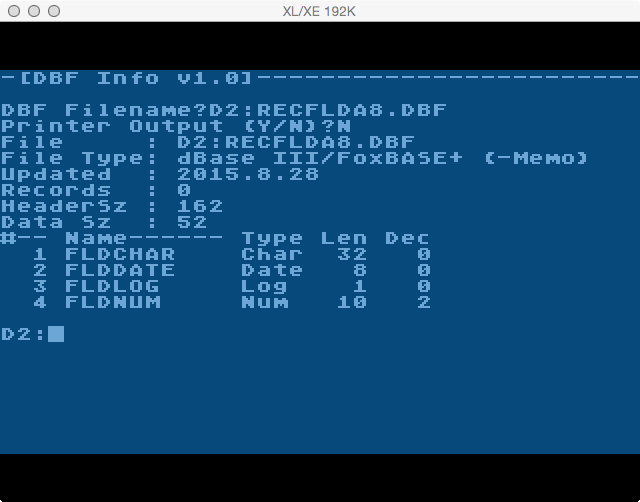 This is a brief explanation of the the dBase III DBF file structure. This is a brief explanation of the dBase III DBT file structure. 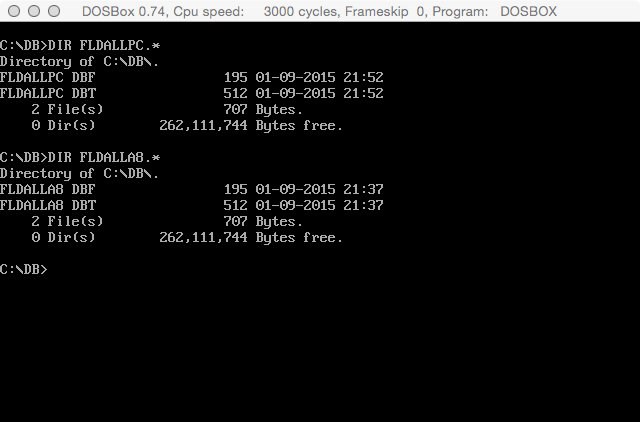 Bytes 1 through 4 : The index of the next available memo location within the DBT file. Encoded in LSB/MSB form. 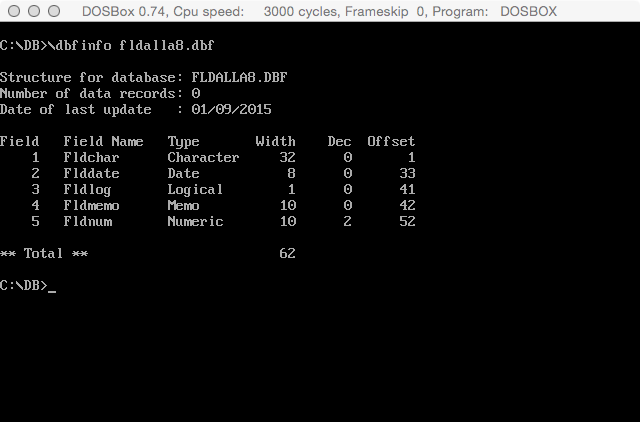 Remaining bytes (through 512): Memo field data. The last memo field in the DBT will not be the full 512 bytes, it will terminate at the conclusion of the memo field data. ; Desc...: Create dBase III DBF file. ; 4 bytes, rest is 0. This is the end of the field input loop. It continues until one of the conditions is true. The length of a fields input is 0, the maximum number of field definitions is reached, or the exit flag is set TRUE. Since we are creating a new file, the number of data records will always be 0. Fill bytes 5,6,7,8 with $00. You an download the ATR image here. Rename it from .key to .ATR. Sorry for the inconvenience, the hosting provider doesn’t allow .ATR files. Here is a link to a well documented dBase file structure.